universal part // Scooter Shop Zeibe Moto Leather Cleaner Pack Display includes Zeibe Cleaner 8x150ml and Protector 8x100ml Kits - Perfect Gift Set for Motorcycle Riders! Scooter Shop Zeibe Moto Leather Cleaner Pack Display includes Zeibe Cleaner 8x150ml and Protector 8x100ml Kits - Perfect Gift for Motorcycle Riders! 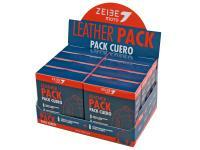 Dealer packaging unit with 8 Leather Packs. One Zeibe Leather Pack contains 1x150ml Leather Cleaner, a technical cream to clean and hydrate motor biker leather jackets, trousers and suits (plus information about cleaning and hydrating your leather jacket), and 1x100ml Leather Protector spray, a technical waterproof for motor biker leather jackets, trousers and suits (plus information about waterproofing your leather jacket).